Terminology matters for science. If people use different words for the same thing, or even worse, the same word for different things, scientific communication turns into a dialogue of the deaf. European Radical Right Studies are a field where this is potentially a big problem: we use labels like “New”, “Populist”, “Radical”, “Extreme” or even “Extremist” with abandon. But how bad is it really? In a recent chapter (author’s version, not paywalled), I argue that communication in Radical Right studies still works. Texts using all 50 shades of “Right” are still cited together, indicating that later scholars realised they were all talking about (more or less) the same thing. I have written a number of short blogs about the change in terminology over time, the extraction of the co-citation network, and the interpretation of the findings. But sometimes, all this reading is getting a bit much, and so I tried something different: using some newfangled software for noobs, I turned my findings into a short video. Have a look for yourself and tell me what you think. 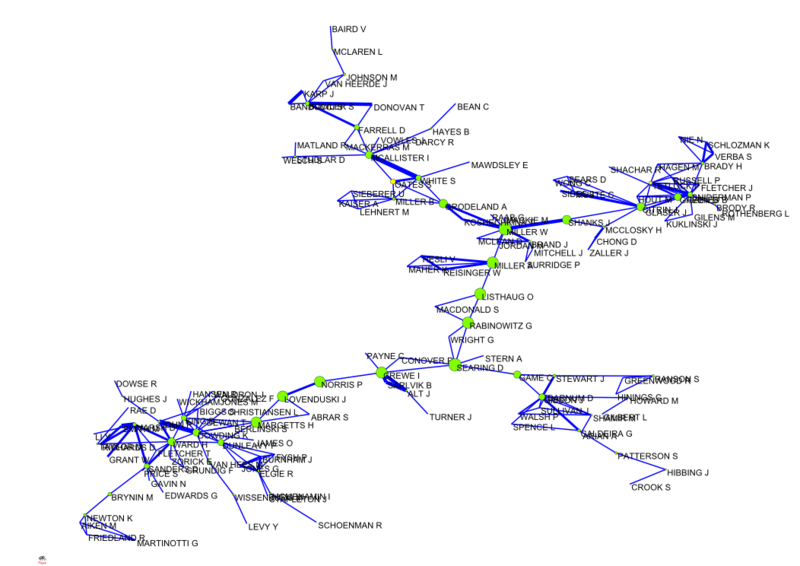 In the last post, I tried to reconstruct the co-citation network in European Radical Right studies and ended up with this neat graph. The titles are arranged in groups, with the “Extreme Right” camp on the right, the “Radical Right” group in the lower-left corner, and a small number of publications that is committed to neither in the upper-left corner. The width of the lines represents the number of co-citations connecting the titles. What does the pattern look like? The articles by Knigge (1998) and Bale et al. (2010) are both in the “nothing in particular” group, but are never cited together, at least not in the data that I extracted. One potential reason is that they are twelve years apart and address quite different research questions. Want to watch a video of this blog? Apart from this gap, the network is complete, i.e. everyone is cited with everyone else in the top 20. This is already rather compelling against the idea of a split into incompatible two incompatible strands. Intriguingly, there are even some strong ties that bridge alleged intellectual cleavages, e.g. between Kitschelt’s monograph and the article by Golder, or between Lubbers, Gijsberts and Scheepers on the one hand and Norris and Kitschelt on the other. While the use of identical terminology seems to play a minor role, the picture also suggests that co-citations are chiefly driven by the general prominence of the titles involved. However, network graphs can be notoriously misleading. counts of co-citations amongst the top 20 titles, ranging from 0 to 5476, with a mean count of 695 and a variance of 651,143. Because the variance is so much bigger than the mean, a regression model that assumes a negative binomial distribution, which can accommodate such overdispersion, is more adequate than one built around a Poison distribution. “General prominence” is operationalised as the sum of external co-citations of the two titles involved. Here are the results. The findings show that controlling for general prominence (operationalised as the sum of co-citations outside the top 20), using the same terminology (coded as “extreme” / “radical” / “unspecific or other” does have a positive effect on the expected number of co-citations. But what do the numbers mean? The model is additive in the logs. To recover the counts (and transform the model into its multiplicative form), one needs to exponentiate the coefficients. Accordingly, the effect of using the same terminology translates into a factor of exp(0.424) = 1.53. But how relevant is this in practical terms? Because the model is non-linear, it’s best to plot the expected counts for equal/unequal terminology, together with their areas of confidence, against a plausible range of external co-citations. 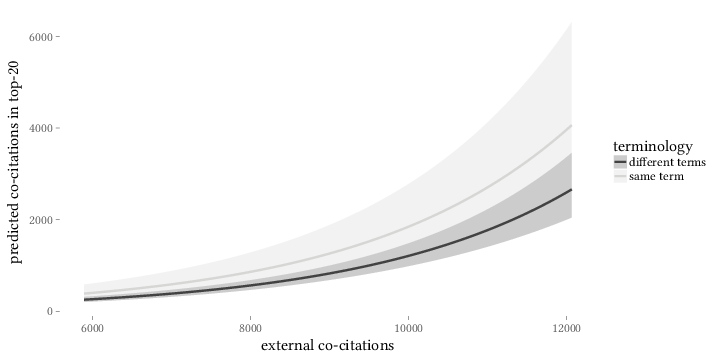 As it turns out, terminology has only a small effect on the expected number of co-citations for works that have between 6,000 and 8,000 external co-citations. From this point on, the expected number of co-citations grows somewhat more quickly for dyads that share the same terminology. 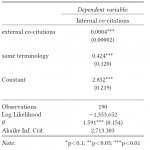 However, over the whole range of 6,000 to 12,000 external co-citations, the confidence intervals overlap and so this difference is not statistically significant. Unless two titles have a very high number of external co-citations, the probability of them being both cited in a third work does not depend on the terminology they use. Even for the (few) heavily cited works, the evidence is insufficient to reject the null hypothesis that terminology makes no difference. While the analysis is confined to the relationships between just 20 titles, these titles matter most, because they form the core of ERRS. If we cannot find separation here, that does not necessarily mean that it does not happen elsewhere, but if happens elsewhere, that is much less relevant. So: no two schools. Everyone is citing the same prominent stuff, whether the respective authors prefer “Radical” or “Extreme”. Communication happens, which seems good to me. For a long time, people working in the field of European Radical Right Studies could not even agree on a common name for the thing that they were researching. Should it be the Extreme Right, the Radical Right, or what? Utterly unimpressed by this fact, I argue in a in-press contribution that this sorry state has not seriously hindered communication amongst authors. Do I have any evidence to back up this claim? Hell yeah! Fasten your seatbelts and watch me turning innocent publications into tortured data, or more specifically, a Radical Right network of co-citations. Or was it the Extreme Right? Short of training a hypercomplex and computationally expensive neural network (i.e. a grad student) to look at the actual content of the texts, analysing citation patterns is the most straightforward way to address the research question. Because I needed citation information, I harvested the Social Science Citation Index (SSCI) instead of my own bibliography. The Web of Science interface to the SSCI lets you save records as plain text files, which is all that was required. The key advantage of the SSCI data is that all the sources that each item cites are recorded, too, and can be exported with the title. This includes (most) items that are themselves not covered by the SSCI, opening up the wonderful world of monographs and chapters. To identify the two literatures, I simply ran queries for the phrases “Extreme Right” and “Radical Right” for the 1980-2017 period. I used the “TS” operator to search in titles, abstracts, and keywords. These queries returned 596 and 551 hits, respectively. Easy. But how far separated are the two strands of the literature? To find out, I first looked at the overlap between the two. By overlap, I mean items that use both phrases. This applies to 132 pieces, or just under 12 per cent of the whole stash. This is not a state of zilch communication, yet by this criterion alone, it would seem that there are indeed two relatively distinct literatures. But what I’m really interested in are (co-)citation patterns How could I beat two long plain text lists of articles and the sources they cite into a usable data set? So what are the most cited titles in Extreme/Radical Right studies? Importantly, this top ten contains (in very prominent positions) a number of monographs. The SSCI itself only lists articles in (some) peer-reviewed journals. Without the citation data, we would have no idea which non-peer-reviewed-journal items are important. Having said that, the situation is still far from perfect: We only observe co-citation patterns through the lens of the 1,000+ odd SSCI publications. But that’s still better than nothing, right? What about the substantive results of this exercise? The table clearly shows the impact that Cas Mudde’s 2007 (“Populist Radical Right”) book had on the field. It is the most cited and at the same time the youngest item on the list, surpassing the much older monographs by Betz (“Radical Right Wing Populism”) and Kitschelt (“Radical Right”). Two other monographs by Carter (“Extreme Right”) and Norris (“Radical Right”) are also frequently cited but appreciably less popular than the books by Betz, Kitschelt, and Mudde. The five other items are journal articles with a primarily empirical outlook and mostly without conceptual ambitions. Taken together, this suggests that the “Extreme Right” label lacked a strong proponent whose conceptual work was widely accepted in the literature. Once someone presented a clear rationale for using the “Radical Right” label instead, many scholars were willing to jump ship. 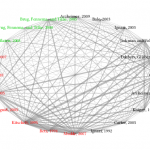 Getting to the co-citation network: are the Extreme / Radical Right literatures separated from each other? If this was indeed the case, the literature should display a low degree of separation between users of both labels. Looking for co-citation patterns is a straightforward operationalisation for (lack of) separation. A co-citation occurs when two publications are both cited by some later source. By definition, co-citations reflect a view on the older literature as it is expressed in a newer publication. When two titles from the “Extreme Right” and “Radical Right” literatures are co-cited, this small piece of evidence that the literature has not split into two isolated streams. The SSCI aims at recording every source that is cited, even if the source itself is not in the SSCI. This makes for a very large number of publications that could be candidates for co-citations (18,255), even if most of them are peripheral European Radical Right studies, and a whopping 743,032 actual co-citations. Citations and co-publications are one important indicator of scientific communication and collaboration. 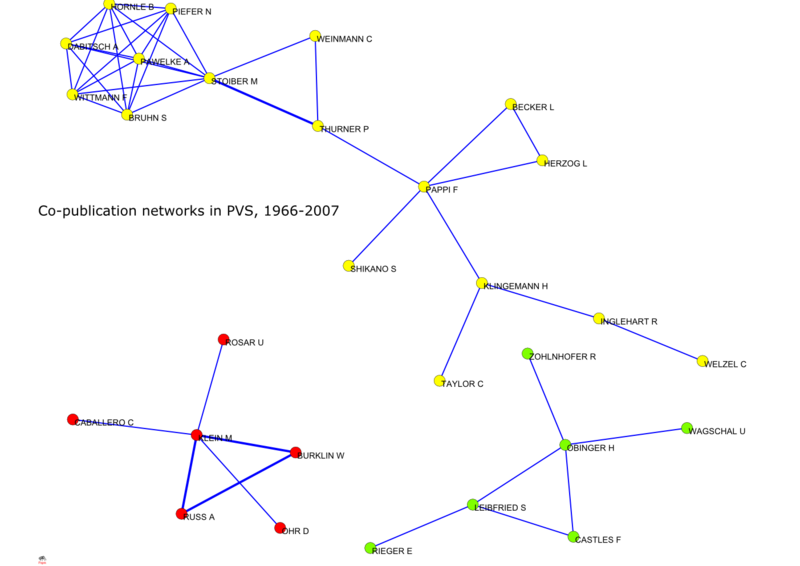 By studying patterns of citation and co-publication in four major European Political Science journals (BJPS, PS, PVS and ÖZP), we demonstrate that compared to the conduits of communication in the natural sciences, these networks are rather sparse. British Political Science, however, is clearly less fragmented than its German speaking counterpart. 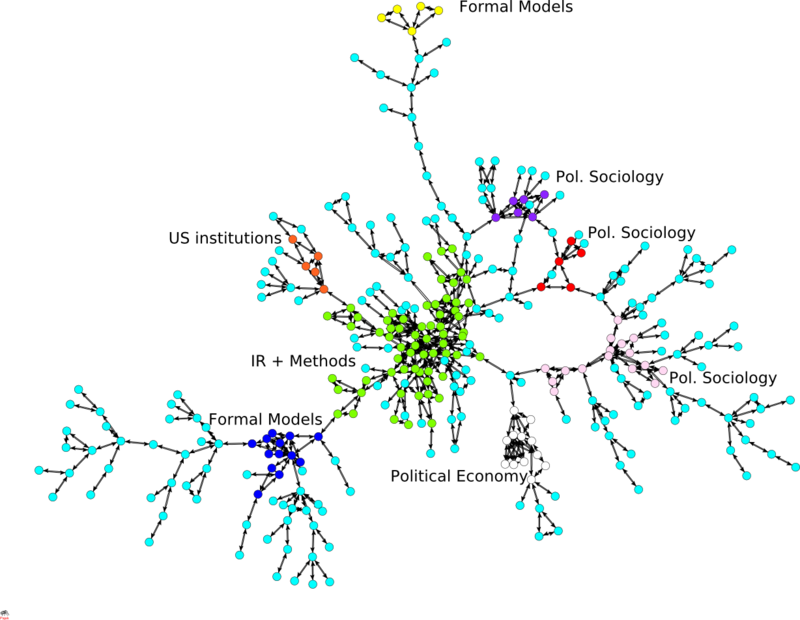 Our project on social (citation and collaboration) networks in British and German political science involves networks with hundreds and thousands of nodes (scientists and articles). At the moment, our data come from the Social Science Citation Index (part of the ISI web of knowledge), and we use a bundle of rather eclectic (erratic?) scripts written in Perl to convert the ISI records into something that programs like Pajek or Stata can read. Some canned solutions (Wos2pajek, network workbench, bibexcel) are available for free, but I was not aware of them when I started this project, did not manage to install them properly, or was not happy with the results. Perl is the Swiss Army Chainsaw (TM) for data pre-processing, incredibly powerful (my scripts are typically less than 50 lines, and I am not an efficient programmer), and every time I want to do something in a slightly different way (i.e. I spot a bug), all I have to do is to change a few lines in the scripts. After trying a lot of other programs available on the internet, we have chosen Pajek for doing the analyses and producing those intriguing graphs of cliques and inner circles in Political Science. Pajek is closed source but free for non-commercial use and runs on Windows or (via wine) Linux. It is very fast, can (unlike many other programs) easily handle very large networks, produces decent graphs and does many standard analyses. Its user interface may be slightly less than straightforward but I got used to it rather quickly, and it even has basic scripting capacities. The only thing that is missing is a proper manual, but even this is not really a problem since Pajek’s creators have written a very accessible introduction to social network analysis that doubles up as documentation for the program (order from amazon.co.uk, amazon.com, amazon.de. However, Pajek has been under constant development since the 1990s (!) and has acquired a lot of new features since the book was published. Some of them are documented in an appendix, others are simply listed in the very short document that is the official manual for Pajek. You will want to go through the many presentations which are available via the Pajek wiki. Here is a rather messy collection of links to sna software. Generally, you will want something that is more systematic and informative. Ines Mergel has recently launched a bid for creating a comprehensive software list on wikipedia. The resulting page on social network analysis software is obviously work in progress but provides very valuable guidance.